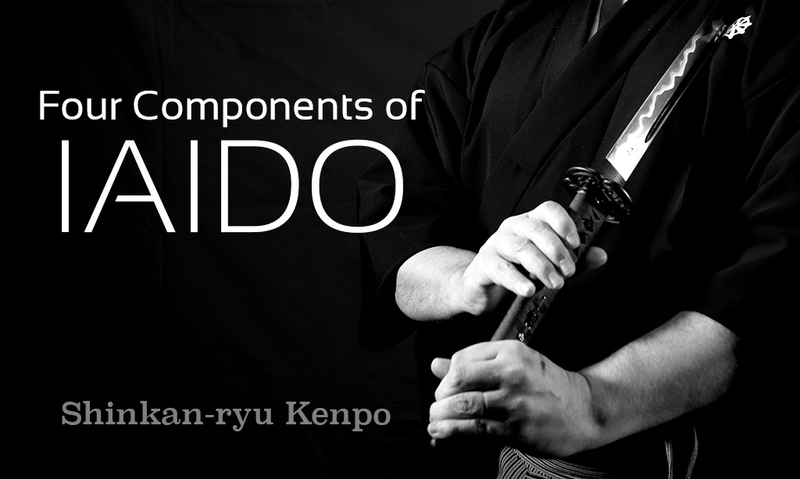 Below I briefly explain the four major components of iaidō. I also added two* more for clarification. Although these are general components not all styles nor techniques in the same school consist of all the components. Sometimes all four are there are used, and sometimes they are a little different. The first major component of Iaijutsu is the drawing or deployment of the sword. This is some times done as a draw and cut with one motion. This is what nukitsuke refers to. However, not all first motions with the sword are used to cut. Every school has different methods of drawing and utlizing the sword once deployed fully from the saya. There is a minor component of Iaijutsu that sometimes follows the initial draw or deployment. 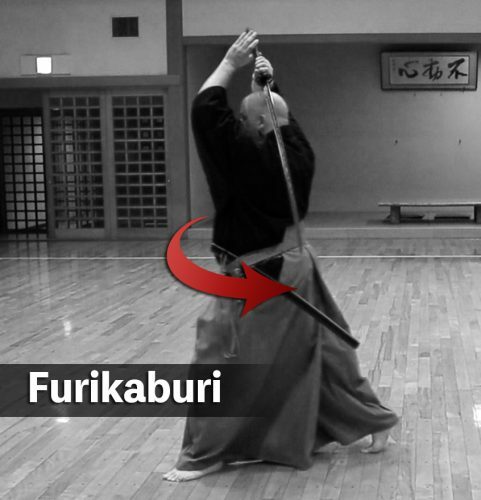 This movement is usually referred to as furikaburi. This motion brings the sword around the head to begin the next or final cut. Some techniques do not use this. It can often be missing from many waza. I label this is a minor component. 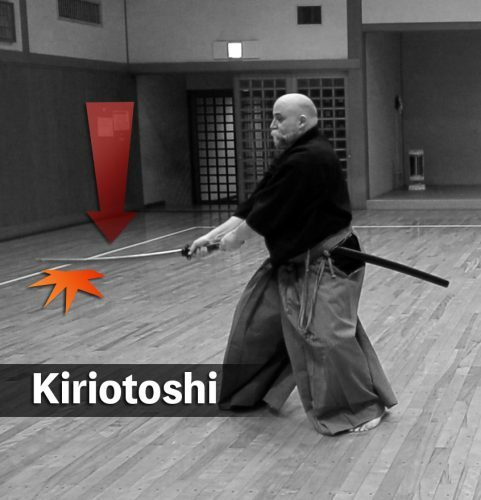 The second major component of Iaijutsu is kiriotoshi or kiritsuke. Usually, after the sword is deployed, there is a significant strike that is considered the final blow. This is not always the last strike of a form, however. Kiriotoshi is sometimes referred to as kirioroshi. Kiriotoshi means drop-cut. These cuts are some of the most potent cuts in swordsmanship. Some schools have entirely different methodologies of their kiriotoshi. In Shinkan-ryū Kenpō the kiriotoshi has subtle aspects that are important to its practices. 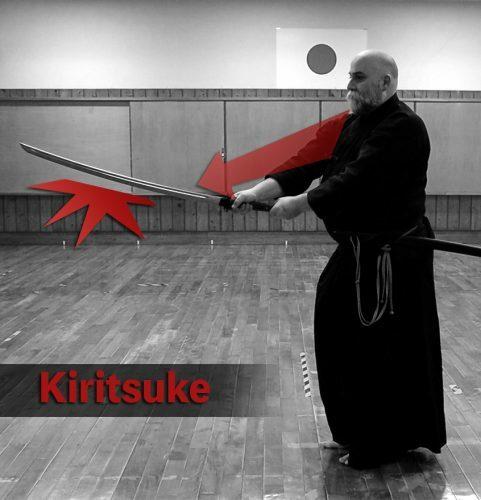 The second part of the second major component of Iaijutsu is kiritsuke. 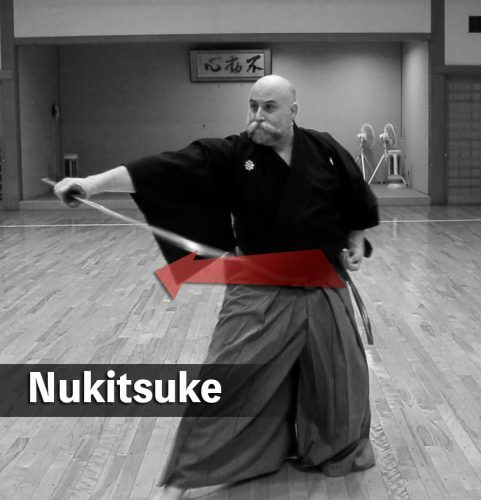 After nukitsuke there might follow a strike with the sword that is not a dropcut. It can likewise be a series of strikes. These are generally referred to as kiritsuke. It literally means cutting/slashing. Iaido and Iaijutsu generally feature either kiriotoshi or kiritsuke. Many techniques have both. The third component of Iaijutsu is chiburi. 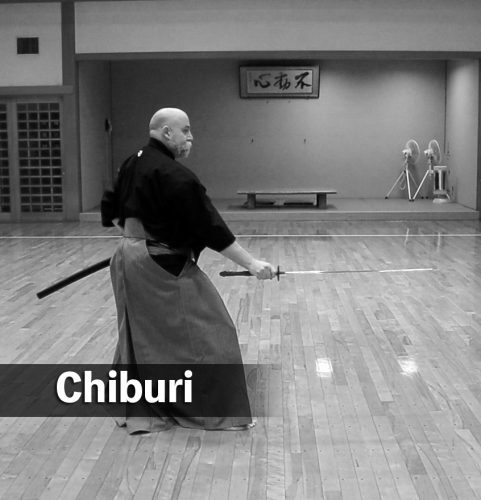 After all the striking is done, before returning the sword the act of chiburi is completed. Chiburi is the symbolic shaking off of the blood from the sword. This is done in a myriad of ways. Many schools throughout history used different methods. The primary purpose of this act was for training in general. Some schools do not have actual movements to remove the blood but instead have the same moments of mental focus (zanshin) that remain after the attack has been completed. Some schools make use of a tissue or cloth, or even their shoulder or hakama to remove the blood in place of the act of chiburi (shaking of blood). 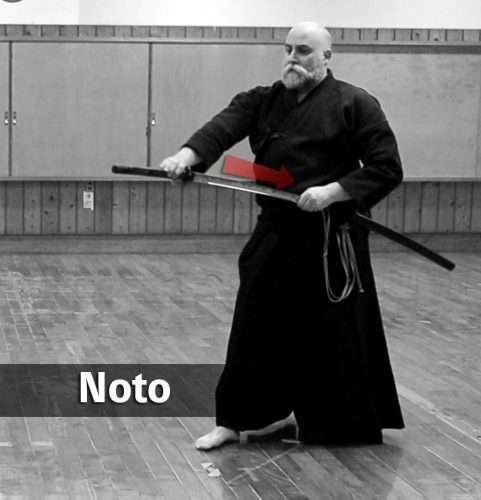 The fourth and final component of Iaijutsu is nōtō. After chiburi is completed, the sword is returned to the saya. There are many styles to noto as well. Nōtō is a time to keep and not lose concentration as it does not mark the end of an engagement. Thank you for the break-down, Steven-sensei. Awesome post sensei. Gets me inspired! Thanks Sensei. Looking forward to working these.